Say what you will about Elon Musk, and there’s plenty to be said over the last few years — he’s been fined $20 million for securities fraud, he’s smoked pot on a podcast, and he’s been tweeting some pretty weird stuff — but he still knows how to get things done. Elon Musk has said that the Boring Company’s first tunnel is on track to open on 1oth December. After an opening party, the tunnel, which is two miles long, will offer free rides to the public the following day. It’s a pretty rapid conclusion to a plan that had been born out of a few tweets in December 2016. 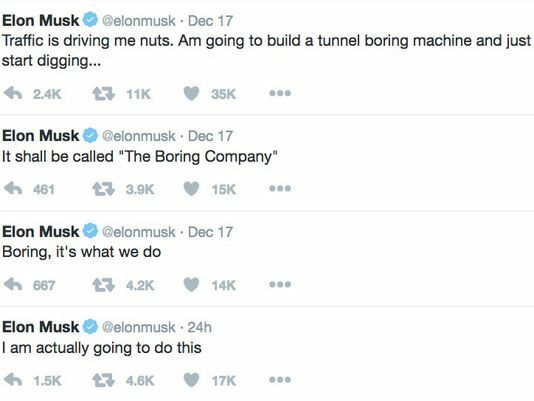 Less than two years ago, Musk had sent out these series of tweets while stuck in traffic. He’d appeared to spontaneously come up with an idea to dig tunnels underneath the roads, thus avoiding the gridlocked traffic that LA is infamous for. In typical Muskian fashion, he’s said the company would be called the Boring Company. Not many had taken him seriously, but four months after the first announcement, a large cylinder with “Boring Company” written on it had been spotted outside the SpaceX office, immediately setting off a whole lot of speculation that Musk might actually be going through with his plan. That had been confirmed a few days later, when Musk had showcased his entire idea with a video. The Boring Company would build tunnels under cities, and cars would travel thorough them at over 200 kmph on electric rails — this was supposed to help reduce traffic, and dramatically cut commute times. Some critics had scoffed at the idea. People had come up with flaws, including how the tunnels would hold up during earthquakes, and whether the whole scheme was practical at all. But Musk had powered on, sharing on Twitter the progress of his tunnels, and videos of electric skates running through them. And less than two years later, Musk has something concrete to show for his efforts. On 10th December, his first tunnel will open, and will start carrying members of the public. It’s still a proof of concept — the tunnel runs under SpaceX’s headquarters in Hawthorne, California, and won’t help in any actual commutes just yet. But Musk will hope that seeing a tunnel in action will eventually convince skeptics into believing that his plan has potential. It remains to be seen if his tunnels actually catch on, but to have done something like this from from ideation to completion in two short years is nothing short of remarkable. Elon Musk might have his quirks, but he’ll probably still go down as the most influential entrepreneur of his generation.